Around 100 protesters against the Dakota Access Pipeline are defying North Dakota governor's eviction notice, choosing to remain at the Oceti Sakowin camp in an act of non-violent resistance. Most of the camp was burned earlier in the day. The US Army Corps of Engineers set a 2pm (Central Time) deadline for the protesters to leave the camp. About 150 people marched out the camp this morning, leaving nearly 100 defying the eviction notice and stating they won’t leave of their own accord. Nathan Phillips, a member of the Omaha Tribe in Nebraska, told AP he planned to move to another camp that's on private land. He said he had been in North Dakota since Thanksgiving and has "had four showers since." The 2pm deadline passed with law enforcement remaining parked in cars away from the campsite, making no move to round up the remaining protesters. Most of the protesters have relocated to the nearby Sacred Stone camp. Those remaining at the Oceti Sakowin site could face charges of criminal trespassing and violating the governor’s executive order. 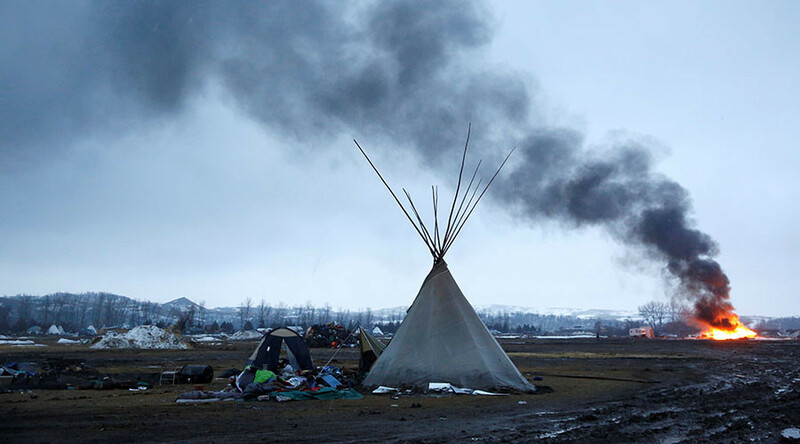 Activists at Oceti Sakowin have been protesting the construction of the Dakota Access Pipeline (DAPL) since March 2016. They have argued the pipeline segment under Lake Oahe on the Missouri River would threaten the water supply of the nearby Standing Rock Sioux reservation.